Product Detail Summary: Hmmmm... this page got use after-all (just not for the Halo Mega Bloks Firebase)! The Combat Utility Transport in the Light Armor Firebase is a military vehicle meant for fast ground transport and support of infantry in hazardous situations. The buildable Combat Utility Transport measures 8L x 8W x 5.5H in inches, and comes with a rotating machine gun turret , removeable mesh side caging and all-terrain tires that really spin. The buildable firebase and the camouflage mesh canopy can attach to the Combat Utility Transport to offer protection for your troops. 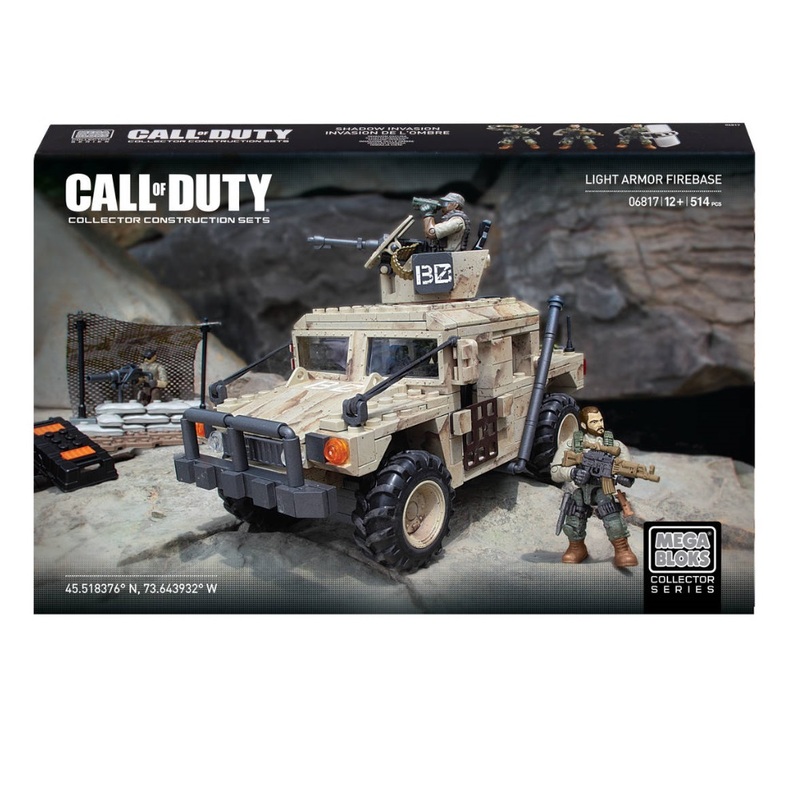 Alex Mason and his team of two other Special Forces troopers possess extreme poseability for any combat scenario, and highly detailed, authentic interchangeable accessories and weapons that allow for mission-specific customization. • Buildable Combat Utility Transport 8L x 8W x 5.5H inches with rotating machine gun turret, mesh caging and cool tires that really spin. • Includes 30 highly detailed, interchangeable accessories and weapons like removable combat vests, binoculars, entrenching tool (E-Tool), first aid kit, riot shield, walkie-talkie, flashlight, canteen, ammo pouch, combat knives and more!